Delivery from £4.99 to United Kingdom in 2 - 3 working days. 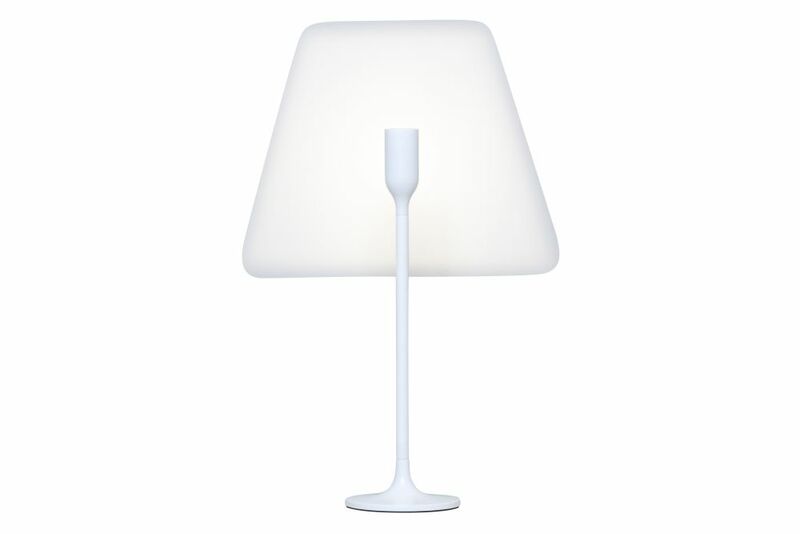 Yoy Table Lamp is an enticing blend of mystery, illusion and the latest long-lasting LED technology. White powder-coated LED aluminium table lamp (with internal steel base weight) which projects it's own traditional style lampshade onto the wall. A very small footprint makes it perfect for bedside, shelf or sideboard lighting. The perfect portable gift, as each lamp comes beautifully gift packaged. YOY [joi] is a Tokyo based design studio composed by Naoki Ono, a spatial designer, and Yuki Yamamoto, a product designer. Started in 2011, their design theme is to create a new story between space and objects. Naoki Ono (left) was born in Nagoya, 1981. He graduated in architectural design at Kyoto Institute of Technology in 2008. Yuki Yamamoto (right) was born in Nagoya, 1985. He graduated in industrial design at Kanazawa College of Art in 2008. Innermost founders Steve Jones and Russell Cameron first spotted YOY and Canvas in April 2013 at Salone Satellite in Milan.